When it comes to keeping your Audi vehicle running in perfect condition, you can trust the experts at Audi Kitchener-Waterloo. Our team of technicians and service advisors has years of experience working with every Audi model, and we know how to ensure its reliability and quality. And because we only use state-of-the-art tools and equipment, you can trust the quality of our work. From simple oil changes and tune-ups to complex repairs, we have you covered at Audi Kitchener-Waterloo. When you come to our service department, you will always be treated with care and dedication, and everything will be explained to you in advance to avoid any surprises. Moreover, Audi Kitchener-Waterloo offers a comfortable waiting lounge where you can relax as you wait for your vehicle. We also provide you with a shuttle service and loaner car if needed. At Audi Kitchener-Waterloo, we have you covered every step of the way. Our technicians only use genuine Audi parts in all of their repairs and they are continually trained by the manufacturer to ensure their skills meet our stringent quality standards. To learn more about our maintenance and repair services, contact us today at Audi Kitchener-Waterloo! 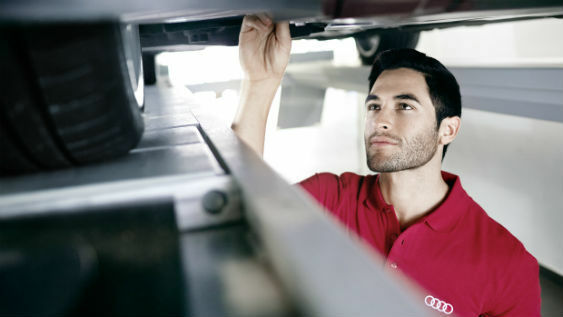 Ready to have our highly trained technicians service your Audi? Don’t hesitate to call and speak with one of our service consultants. Experience our well-earned reputation for excellent customer service. Audi Kitchener-Waterloo offers a maintenance schedule for every Audi vehicle, which dates back many years. Before you schedule a service appointment, have a look at the maintenance schedule so you're aware of the recommended work that should be completed. You can always order the parts you need online to save time and money. Your Audi has been designed, engineered, and manufactured to exacting standards. So, it only makes sense to treat it to parts and accessories that match our factory best.